I received free samples of California Dried Plums mentioned in this post. By posting this recipe I am entering a recipe contest sponsored by California Dried Plum Board and am eligible to win prizes associated with the contest. I was not compensated for my time. Texture can make or break a food. When it comes to dessert, I’ll take a tres leches cake or bread pudding over almost anything else. I love tender, moist treats! A lot of people I talk to aren’t fond of the “sogginess” of these baked goods. The great thing about bread pudding, though, is that you can adjust the “juiciness” of it by using a little less liquid. That way you get lots of flavor without the mush. Unless you like mushy… then go ahead and soak it in custard! Today’s bread pudding recipe is inspired by (1) the sourdough French toast I made for my sister a few weeks ago (AMAZING! ), (2) the massive bottle of bourbon in our pantry (I want to use it in everything right now), and (3) California Dried Plums! Growing up, I only ever had dried plums baked into pork. And as much as I love my mom, the dish was always overcooked and dry. It made me believe I don’t like pork or dried plums. Now I know better. 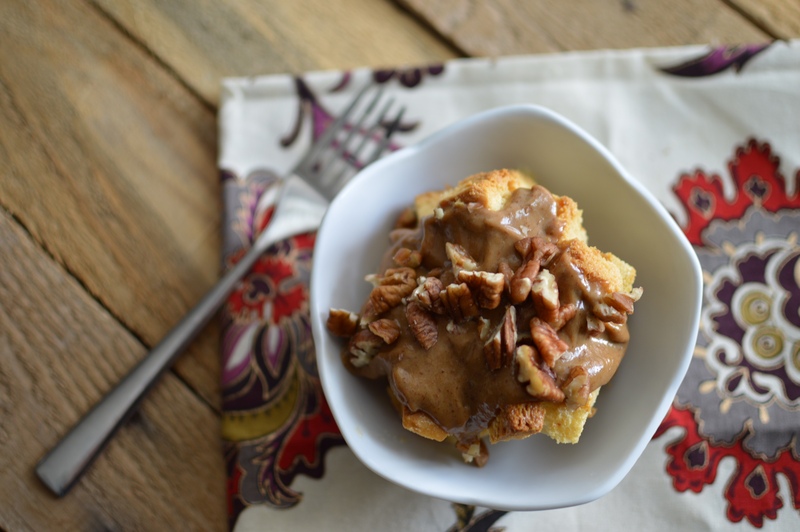 The viscosity and rich flavor of dried plums make the sauce for this lightened up bread pudding taste decadent. 2. 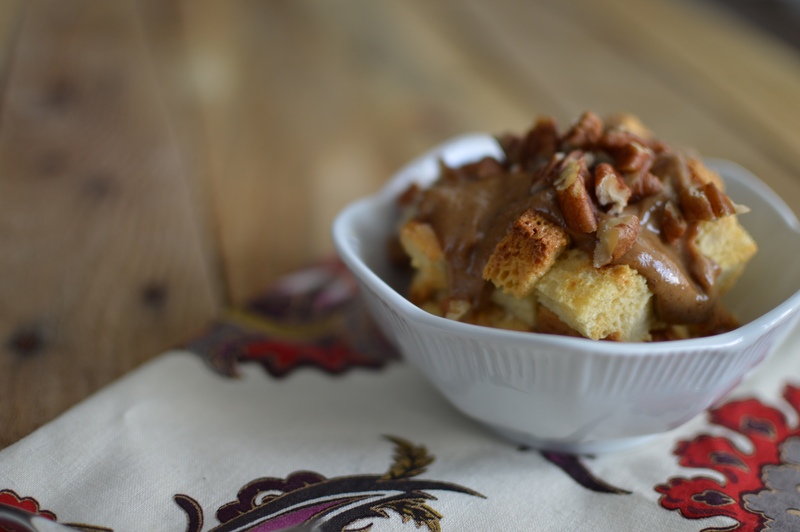 To prepare bread pudding, arrange bread in a single layer on a baking sheet. Bake at 350° for 8 minutes or until lightly toasted. 3. In a mixing bowl whisk together sweetened condensed milk, 1% milk, bourbon, vanilla extract, salt, and eggs. Add bread cubes. Let stand 20 minutes, occasionally pressing on bread to soak up milk. 4. For a thick bread pudding, spoon the bread mixture into a 9 x 5 inch loaf pan coated with cooking spray. For a shallow bread pudding, spoon into a 9 x 9 inch cake pan. Bake at 350° for 45 minutes or until a knife inserted in the center comes out clean. 5. To prepare sauce, combine dried plums, 3 tablespoons bourbon, and butter in a small saucepan over medium-high heat; bring to a boil. Simmer for 2 minutes. Stir in sweetened condensed milk and 3/4 cup low-fat milk. Simmer for 10 minutes. Remove pan from heat. Allow to cool for 5 minutes. 6. Transfer the sauce and plums to a blender and pulse until smooth. Add additional milk until desired consistency is achieved. 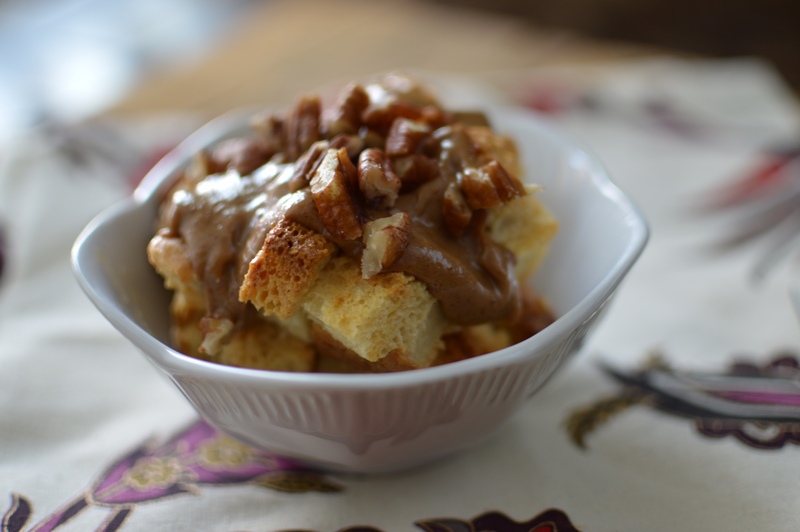 Serve warm sauce with bread pudding and sprinkle with chopped pecans. The dried plums work wonders in this recipe! You can get away with using a lot less sugar and fat in the sauce because of their natural sweetness and creamy consistency when blended. The smoky sweet flavor of prunes pairs well with bourbon and is offset by the subtle tanginess of the sourdough bread. Just a few bites will be enough to satisfy your sweet tooth! I hope you’ll make this for Mother’s Day or another special occasion. I’m off to the Gilcrease Orchard with friends tomorrow morning to harvest some seasonal veggies. You read that right; vegetables grown in the desert! They should have asparagus, beets, carrots, kale, zucchini, and summer squash tomorrow. After the “field trip,” we’re going to workout in matching black and yellow outfits. My friends are so awesome. CAN’T WAIT! It should be a fun weekend!